For she looks mightily like an immortal goddess in beauty. So she is not left here, a punishment for us and our children. Exemplifying this point, in Vergil’s Aeneid, the protagonist Aeneas calls her “the nightmare of both Troy and her homeland” and he considers killing her (Vergil, Aeneid 2.567-88). The Trojan king Priam, however, treats Helen kindly. As they look out over the city walls together, Priam points to Agamemnon, Odysseus, Ajax, and other warriors, while Helen describes them as she knew them. Although she wishes to go home, Helen nevertheless gives useful and honest information about her former allies to the Trojans. Beaten by a stronger man, he who was my husband before you. Helen’s shame over Paris’ cowardice highlights an important belief of this age, that a man’s worth lies in his arete, which means bravery, especially as estimated by other men. 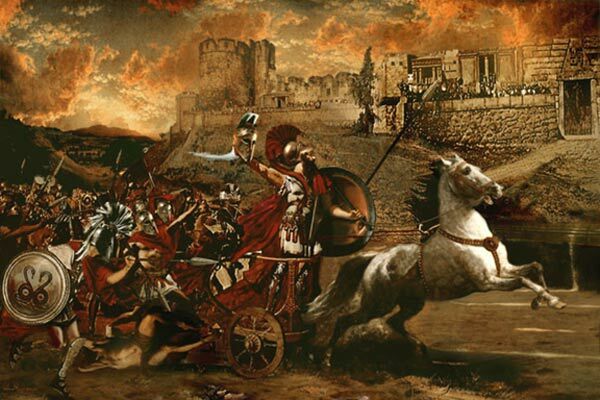 Both Hector and Achilles exemplify this trait and are widely considered valiant. Paris is contrarian, having eschewed Athena’s promises of valor in war in favor of the love offered by Aphrodite. As the war wages on, Paris kills Achilles with an arrow, before he too is killed. While Paris is dying, the Trojans appeal to his first wife, Oenone, who has the gift of healing. But, still heartbroken, Oenone lets Paris die, killing herself shortly after. 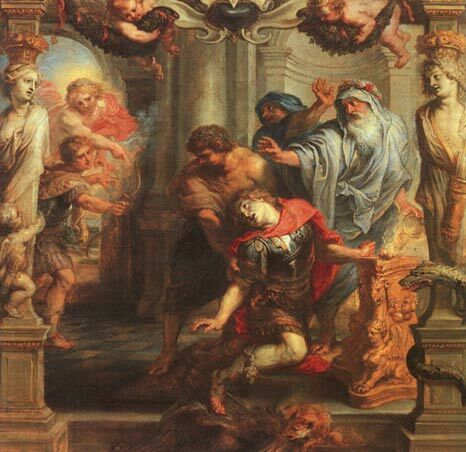 Death of Achilles by Peter Paul Rubens, 1630-1632. Image source . 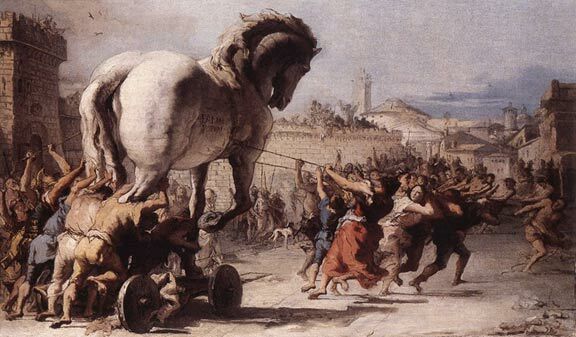 The war ends when the Greeks pretend to sail away and leave behind a huge hollow horse as an offering to the gods. The best Greek warriors hide inside the horse and the Trojans bring it inside. To test whether there is anyone hiding within, but without damaging the gift for the gods, the Trojans have Helen walk around it, imitating the wives of those within. Clever Odysseus keeps them from falling for the trick and shouting out in response. Again we see Helen aiding the Trojans, making her true allegiance at this time hard to determine. “The Procession of the Trojan Horse into Troy” by Giovanni Domenico Tiepolo (1773). Image Source . That night, the Greeks break out of the horse and raze Troy to the ground. Since Paris’ death, Helen had been married to his brother Deiphobus. Helen leads Menelaus and Odysseus to Deiphobus and they cut off his arms, ears, and nose, killing him. All for one woman and her hateful bed! In this version of the story, Helen’s fate is to be killed by her husband Menelaus. In, Homer’s Odyssey, however, the two sail home together, reunited as husband and wife. The next time we see them, they are celebrating the wedding of their daughter Hermione to Neoptolemus, the son of Achilles. The couple also hosts Telemachus while he searches for his father Odysseus, who never returned after the Trojan War. They all weep as Menelaus speaks of Odysseus’ many toils and the fact that he has not returned home. The other Trojan women wailed aloud, but my heart rejoiced! For in my heart I had already hoped to return home. A man lacking nothing in wisdom or beauty. Euripides provides another version of the end of Helen’s life in his play Orestes. Pursued by her bloodthirsty nephew, Helen is rescued by the god Apollo and carried off to Olympus to reunite with her brothers, the Dioscuri, who have become the constellation Gemini. There, she is made an immortal goddess. The character Helen is alternately victim and criminal, loyal wife and heartless adulteress. As each poet and playwright added to her legend over centuries, the character grew in complexity, yielding the layered woman we know as Helen of Troy. Featured image: Triumphant Achilles. Image source . That's all pretty interesting. I've never heard all these differen't versions of the story. But I want to know what really happened. We'll never know. We can only be certain of one thing: that every variant of the Trojan War described (excellently) here... Is better than that awful film with Brad Pitt!